I’m not by any means a sandwich snob. I still eat peanut butter and jelly several times a week for lunch and I’m pretty sure will be perfectly content doing so forever. Similarly, Subway is my road trip staple (extra banana peppers please!). 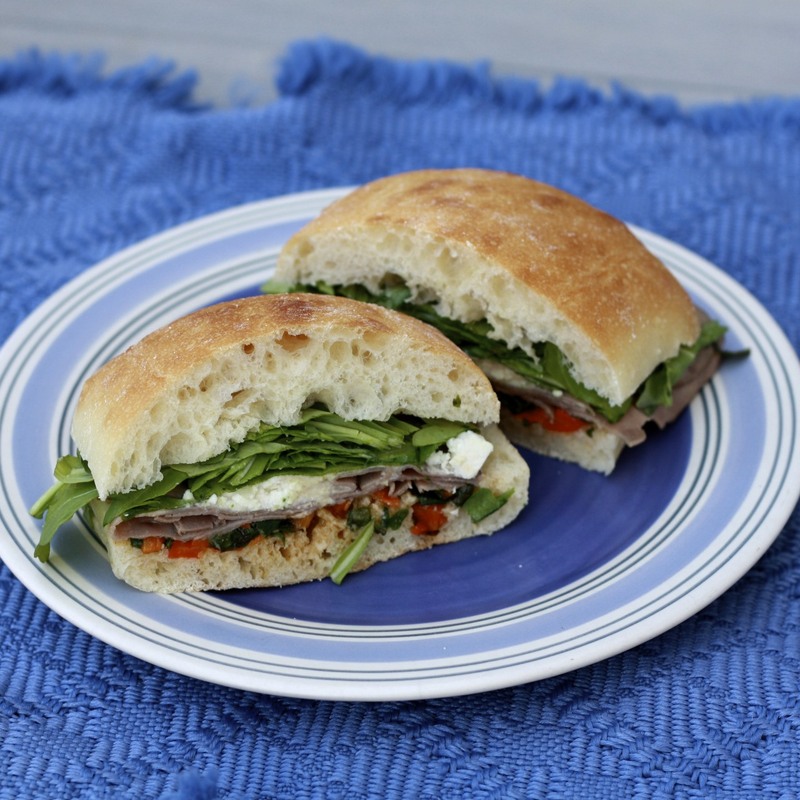 That being said, it’s fun to get a little fancier with sandwiches from time to time. The best thing about these is that they’re made ahead of time—making them a great grab ‘n go option or a perfect picnic food! By letting them sit, the flavors have a chance to really soak into the bread and meld with one another. I wasn’t sure how the combo would fare—I’m used to cheddar and roast beef, not feta and roast beef—but I should’ve known better than to doubt the experts at Bon Appetit! I made a few swaps to the original recipe (arugula for spinach, basil for cilantro) and found I wouldn’t change a thing about this version! Of course, I think they’d be just as good with the original ingredients and you could easily nix the tahini dressing if you don’t normally have it on hand and don’t want to shell out $7 for a jar. Also-thanks to all of you that entered my Chobani giveaway--the winner was Julia Griffith! Julia--email me at natalie@thesweetslife.com and I'll get you in touch with Chobani for your winnings! 1. In a small bowl, combine the red peppers, green onion, basil, olive oil, cumin, hot sauce and 1 garlic clove, stirring to combine. Set aside. 2. In a separate small bowl, combine the other garlic clove with the tahini, water, and lemon. Whisk until smooth and season to taste with salt. 3. Evenly divide the red pepper mixture between each of the rolls, spreading on the bottom of each cut roll. 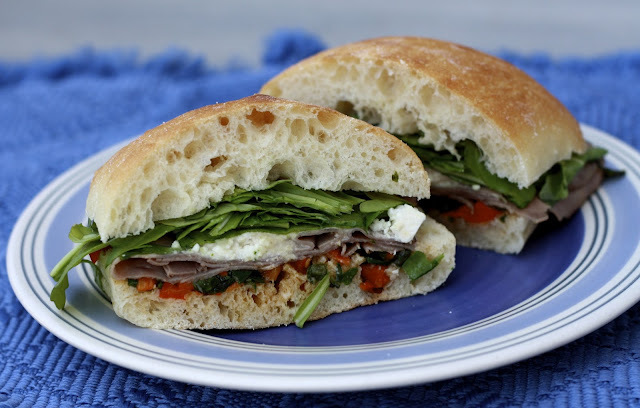 Top with roast beef and feta. Drizzle with tahini dressing and cover with arugula. Place top bun on sandwich and tightly wrap in plastic wrap. Refrigerate for at least 2 hours or overnight. 4. Unwrap sandwiches, cut in half, and serve.